Summer is hard to beat. We love the season for its barbecues, baseball, beach days and water sports, and also for its celebrations of family milestones including graduations and weddings. Some of us will get down to earth and create a vegetable garden. Others will take to the trails for hiking or biking. Still others will slap on some sunscreen, plop down in a backyard lounge chair, and enjoy an instant vacation. Many people consider Memorial Day at the end of May as the traditional start of summer, but the real first day of summer is the Summer Solstice – the day with the longest period of daylight – which this year is June 21. 1. Ice cream is a favorite summer treat all over the world. Which country consumes the most ice cream? 2. Each year, students look forward to summer vacation. However, a school break during the hot summer months has not always been a way of life for students in the U.S. 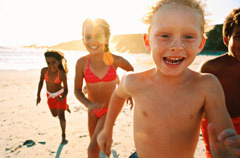 When was summer vacation first introduced? 3. Summer is high season for baseball, considered America’s pastime. The term “boys of summer” often refers to baseball players in general, but actually stems from a book about a particular team. Which team was it? 4. Americans love to travel during the summer. Among the most popular destinations are the national parks. Which was the most visited national park in 2013? 5. Independence Day is a major summer holiday that celebrates the birthday of our nation: July 4, 1776. How many people lived in the new nation when the Declaration of Independence was signed? 1. b. The United States is the world’s largest consumer of ice cream, according to the National Ice Cream Retailers Association. The top-selling flavor is vanilla. 2. a. American educator Horace Mann established the idea of summer vacation when he began initiating school reforms in 1837 as the first secretary of the Massachusetts Board of Education. 3. d. The book “The Boys of Summer” by Roger Kahn is about the Brooklyn Dodgers during the mid 20th Century. 4. c. Great Smoky Mountains National Park in Tennessee and North Carolina was the most visited park in 2013, according to the National Park Service, with nearly 9.4 million visitors. Grand Canyon National Park in Arizona was next, with 4.6 million visitors. 5. b. According to the U.S. Census Bureau, an estimated 2.5 million people lived in the new nation on July 4, 1776. Today the population of the United States is about 318 million. We hope that you and your family enjoyed this summer quiz!